Objective: Electroencephalographic suppression bursts (SBs) in newborns usually indicate a grave neurodevelopmental syndrome; however, they have heterogeneous etiologies and noteworthy phenotypes and outcomes. Methods: We studied 22 newborns with electroencephalographic SBs with varied etiologies, electroencephalographic evolution, associated changes of seizure semiology, and neurodevelopmental outcomes. Results: Five patients had mitochondrial disease, 3 nonketotic hyperglycinemia, 1 citrullinemia, 6 brain structural disease (hydrocephalus with porencephaly: 3, Rubinstein-Taybi syndrome: 1, Aicardi’s syndrome: 1, and Ohtahara syndrome with corpus callosum hypoplasia: 1), 6 severe hypoxic-ischemic encephalopathy (HIE), and 1 SB with an unknown etiology. The outcome was best in patients with unilateral SBs and treatable diseases like citrullinemia: they had mild developmental delays and unilateral SBs with focal structural anomalies. Patients with unilateral SBs had better outcomes, could walk at 3 years old (p<.001), and had better neurodevelopment (p<.001). Their life expectancy was not significantly longer than for patients with bilateral SBs, however. Conclusion: In patients with predominantly synchronous SBs and without lesions in magnetic resonance images, the etiology is usually metabolic or genetic. Patients with synchronous SBs had worse outcomes; specifically, they usually could not walk. The neurodevelopmental outcomes were relatively better in patients with asynchronous rather than with synchronous SBs. Electroencephalographic suppression bursts (SBs) in newborns occur in a pattern of highamplitude discharges, usually consisting of slow waves with or without spikes, and alternate with periods of minimal low-amplitude (< 10 μV) discharges [1-4]. The SB pattern is a characteristic signal in electroencephalograms (EEGs). SBs indicate a major dysfunction of cortical networks, and might evolve into different patterns, as described in post-anoxic patients . According to the International League Against Epilepsy (ILAE) , early epileptic encephalopathy with SBs consists of two distinct epileptic syndromes: early infantile epileptic encephalopathy (EIEE) and early myoclonic encephalopathy (EME). The etiologies of neonatal SB EEG pattern include, among others, nonketotic hyperglycinemia (NKH), amino acidopathies and organic acidopathies, urea cycle disorders, mitochondrial disorders, pyridoxine and pyridoxal-5-phosphate disorders, and sulfite oxidase deficiency,include brain structure abnormalities, hypoxic-ischemic encephalopathy and gene mutations like STXBP, SLC25A22, CDKL5, ARX, SPTAN, PCDH19, KCNQ2, and SCN2A [1-8]. Although their etiologies are varied, their outcomes are generally ominous [1-4,6,7]. EIEE with SBs was first described in 1976 . Since 1978, numerous articles have described an epileptic syndrome with either a neonatal onset or an onset in the first months of life, which is characterized by erratic, fragmentary myoclonus; massive myoclonus; partial seizures; late tonic spasms; and EEG signs like SBs. The ILAE Task Force on Classification and Terminology  proposed to include electroencephalographic SB in the list of epileptic encephalopathies, that is, those conditions in which not only epileptic activity, but also “epileptiform EEG abnormalities themselves are believed to contribute to the progressive disturbance in cerebral function”. The evolution of the EEG and seizure are different in Ohtahara syndrome and EME: (1) tonic spasms in Ohtahara syndrome versus partial seizures and erratic myoclonia in EME; (2) a continuous SB pattern in both waking and sleeping states in Ohtahara syndrome versus EEG SBs, which are almost always limited to the sleeping state in EME; and (3) static structural brain damage in Ohtahara syndrome versus genetic or metabolic disorders in EME . The most important differentiating point is their evolutionary pattern with age, which might reflect their pathophysiologic difference. Ohtahara syndrome evolves into West syndrome and then into Lennox-Gastaut syndrome as the child grows older, but EME shows no such unique evolution; specifically, it continues as is for a long time, or else changes into partial or severe epilepsy with multiple independent spike foci [4,6]. Although neonatal EEG SBs usually indicate a grave syndrome, the etiology and evolution of long-term EEGs and symptoms are noteworthy. We hypothesized that different etiologies had different morphologies in a follow-up EEG. We studied 22 cases of neonatal EEG SBs and describe their EEG morphology, long-term evolution, and clinical outcomes. In our hospital, 5986 pediatric EEGs were done between April 2000 and August 2016. Two hundred seventy-eight patients were younger than 2 months. The records of 22 patients with neonatal SB EEGs were reviewed. Of the 22 patients whose records we reviewed (12 boys, 10 girls; mean age: 1.55 ± 1.83 months; age range: 1.00-6.50 months), the EEG follow-ups lasted 3.19 ± 1.97 years (range: 0.25-9.00 years). Some children were prescribed more than one antiepileptic drug: topiramate (n = 12: 55%), vigabatrin (n = 6: 50%), valproate (n = 3: 14%), phenobarbital (n = 2: 9%), levetiracetam (n = 2: 9%), and clonazepam (n = 1: 5%). Shunts were inserted for hydrocephalus or porencephaly in 3 children (14%). Etiologies were classified by structural case definitions of MRIs with obvious structural disease but without identifying whether the disease was genetic or metabolic. Metabolic cases were defined using a biochemical or genetic diagnosis. Mitochondrial cases were classified as typical Leigh’s syndrome in MRIs with or without a genetic diagnosis or a score compatible with a high probability of mitochondrial disorder [7-9]. Hypoxic-ischemic encephalopathy (HIE) was diagnosed based on clinical staging, Sernat stage, and compatibility with neonatal HIE . The asynchronous SB pattern was defined as “an EEG consisting of unilateral SBs or a bilateral independent appearance of SBs in both hemispheres when recording EEGs”. EEGs were recorded using the routine international 10-20 system, and the EEG focus was determined using referential and bipolar recording, which included longitudinal and transverse montages. The frontal-temporal, frontal-central, temporal-occipital, and central-occipital longitudinal measurements are double-distance recordings. We used conductive adhesive electrode paste to affix the electrodes. A respiratory belt and synchronized video (if available) were used to monitor the infant’s behavioral stages to help us distinguish artifacts from epileptiform discharges. Electrocardiographic (ECG) leads were fixed to the infant’s chest to record variations of the heart rate and to allow us to distinguish ECG artifacts on the EEG. The amplified signal was digitized using an analog-to-digital converter after it had passed through an anti-aliasing filter. Analogto- digital sampling occurs at 256-512 Hz in a clinical scalp EEG. Because very slow waves (0.2- 0.5 Hz) occur in the neonate, the low-frequency filter was set at 0.005-0.01 Hz and the highfrequency filter at 70 Hz . The EEGs were reviewed by two trained pediatric neurologists. The changes of EEG morphology and of seizure semiologies and outcomes were studied. Developmental quotients were measured using the Bayley Scales of Infant Development, Second Edition (BSID-II), or the Third Edition (BSID-III) if the patient was alive. The neurodevelopmental outcomes were divided into four groups: No Developmental Delay; Mild Developmental Delay; Moderate Developmental Delay; and Severe Developmental Delay. The study was conducted as per the institute ethical committee guidelines and informed consents were obtained from parents. Ethical approval of the study was provided by the hospital’s IRB (CS13036). We studied 22 newborns with SBs with varied etiologies, evolution of EEGs (Table 1), and associated changes of seizure semiologies: 5 had mitochondrial disease: Leigh’s syndrome = 4 (1 documented mitochondrial DNA depletion syndrome [MDS] and 1 with mitochondrial disorder using scoring for mitochondrial disease), nonketotic hyperglycinemia (NKH) = 3, and citrullinemia = 1. Six had brain structural disease: hydrocephalus with porencephaly = 3, Rubinstein-Taybi syndrome with corpus callosum partial agenesis = 1, Aicardi’s syndrome = 1, and Ohtahara syndrome (Figure 1) with brain malformation = 1. Six had severe HIE, and despite an extensive workup, the etiology of one was unidentifiable. 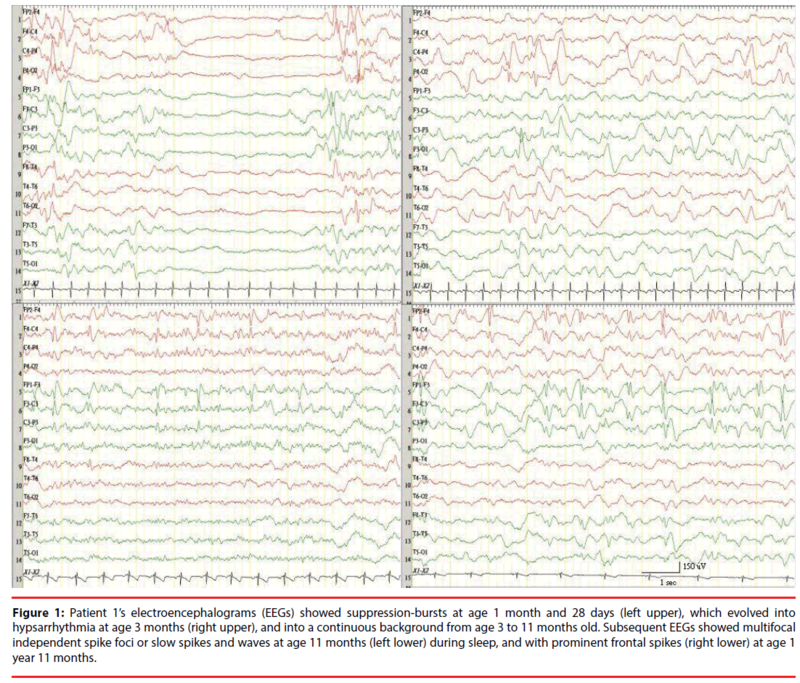 Figure 1: Patient 1’s electroencephalograms (EEGs) showed suppression-bursts at age 1 month and 28 days (left upper), which evolved into hypsarrhythmia at age 3 months (right upper), and into a continuous background from age 3 to 11 months old. Subsequent EEGs showed multifocal independent spike foci or slow spikes and waves at age 11 months (left lower) during sleep, and with prominent frontal spikes (right lower) at age 1 year 11 months. Table 1: Summary of etiologies in 22 patients with EEG suppression bursts. Four patients (Ps) had SB patterns with metabolic etiologies: NKH in P2 (Figure 2), P20, and P21, and citrullinemia in P5. All patients with NKH had combined synchronous and asynchronous SBs, but most were synchronous. Patients with citrullinemia had only asynchronous SBs, but with an inhibition of background in both hemispheres. All 3 patients with NKH died. One patient with citrullinemia had a mild developmental delay (DD) at 3 years old after an exchange transfusion and a liver transplantation at 2 years old. 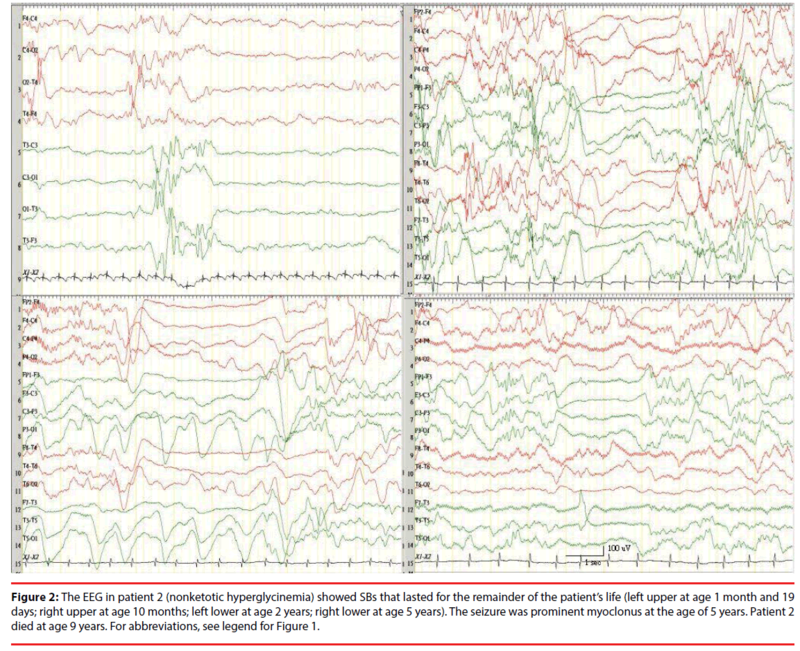 Figure 2: The EEG in patient 2 (nonketotic hyperglycinemia) showed SBs that lasted for the remainder of the patient’s life (left upper at age 1 month and 19 days; right upper at age 10 months; left lower at age 2 years; right lower at age 5 years). The seizure was prominent myoclonus at the age of 5 years. Patient 2 died at age 9 years. For abbreviations, see legend for Figure 1. Five patients (P7, P10, P13, P14, and P18) had a mitochondrial disorder. Four patients had been diagnosed with Leigh’s syndrome, one of whom had mitochondrial depletion syndrome with a reduced mitochondrial DNA (mtDNA) copy number and a respiratory chain defect . One (P18) had refractory seizures with a lactate peak in brain magnetic resonance spectroscopy (MRS) (lactic acidosis in cerebral spinal fluid [CSF] lactate), which was probably mitochondrial disease, a consensus mitochondrial disease scoring system . Two patients with mitochondrial diseases died, and 3 had severe DDs during the follow-up. More SBs in patients with mitochondrial disorders, especially in those with Leigh’s syndrome, appeared to be synchronous rather than asynchronous. However, in patients with NKH, SBs were both synchronous and asynchronous, but predominantly synchronous. The background in both hemispheres was asymmetrical in 6 patients (including P6, P11, and P15, all of whom had porencephaly and had SBs on the same side of the lesion). Three patients (P6: left progressive porencephaly, P15: bilateral anterior cerebral artery [ACA] infarct that evolved into post-hemorrhagic hydrocephalus [PHH], and P11: post-hemorrhagic hydrocephalus) could walk without an ambulatory device before they turned 3 years old and and had moderate DDs. P4, who had Aicardi’s syndrome, had asynchronous bilateral SBs. P22, who had Rubinstein-Taybi syndrome, had a left focal SB and with corpus callosum partial agenesis in the posterior part. P1, who had Ohtahara syndrome and corpus callosum hypoplasia, had a severe DD (bedridden at 3 years old). Neonatal hypoxic-ischemic encephalopathy (P3, P8, P9, P12, P16, P19). All patients with HIE were at Sernat stage III. The backgrounds were more chaotically distributed in patients with unilateral (P16) and bilateral (P8, P9, and P19) SBs, and with synchronous (P8) and asynchronous (P9 and P19) SBs. All patients with HIE had grave neurodevelopmental outcomes (Table 2). §NKH, nonketotic hyperglycinemia HIE, hypoxic ischemic encephalopathy; ACA, anterior cerebral artery; DD, developmental delay; LS, Leigh syndrome; EIEE, Early infantile epileptic encephalopathy; ETC, electron transport chain study; SB, suppression bursts; GA, gestational age; y, years; mo, months; d, days; s, seconds; N/A, not available. †Outcomes: severe DD, moderate, mild DD, or No DD. Table 2: Clinical and laboratory data of 22 patients with EEG suppression bursts. P17, who had EIEE without an identified etiology, even after extensive metabolic tests, a mitochondrial electron transport chain study, and whole exon sequencing. She had focal and synchronous SBs, frequent neonatal seizures (within the first week of life), and apnea. The seizures remitted after she had turned 1 year old, but she had a severe developmental delay at 2 years old. She had been prescribed multiple seizure drugs because of her frequent neonatal seizures. MRIs showed unremarkable findings, and her EEGs eventually showed no SBs but only focal sharp waves. Most (17/22 [77.2%]) seizures in patients with SBs were myoclonic, regardless of whether they were synchronous or asynchronous, and tonic seizures (5/22 [22%]) simultaneously occurred in some of the same patients. However, patients with unilateral SBs had only focal clonic (P5 and P6) or tonic (P15) seizures. Eleven of the 22 patients had myoclonic seizures, and 12 had tonic or clonic seizures. It is worth noting that patients with unilateral SBs seemed to have better outcomes than did patients with bilateral SBs. Structural anomalies varied from porencephaly (P6), to hydrocephalus (P11), to hydrocephalus with a bilateral ACA infarct (P15). Despite the unilateral SBs, only P6 had a normal EEG pattern in the contralateral hemisphere. P11 had continuous background in the contralateral hemisphere; P15 had multiple focal spikes in the contralateral hemisphere; and P5, the only one with unilateral SBs caused by a metabolic factor (citrullinemia), had left-side SBs and almost all isoelectric SBs on the right side before exchange transfusion therapy. The outcomes in P6, P11, and P15 were mild-to-moderate DDs, and, in P5, a mild DD. All could walk without assistance. Four patients had only purely synchronous SBs and 6 both asynchronous and synchronous SBs) (Table 3). Ten patients had bilateral synchronous SBs: P1 had EIEE with an undetermined etiology, corpus callosum hypoplasia, and mixed synchronous and asynchronous SBs; P2, P20 (Figure 3), and P21 had NKH and mixed synchronous and asynchronous SBs; 3 had Leigh’s syndrome with only purely synchronous SBs; 2 had mitochondrial encephalopathy with both synchronous and asynchronous SBs. Only 4 patients had purely synchronous SBs: the 3 with Leigh’s disease and 1 with EIEE without identified etiology (P17). The follow-up periods ranged from 2.5 months to 6 years. Figure 3: Patient 20 was a 34-week-old preterm girl who presented with apnea and frequent myoclonic seizures. The EEG showed prominent SBs when she was 35 weeks old. A glycine decarboxylase (GLDC) gene study showed a compound homozygous mutation: c.2311G>A (p.G771R)/c.660C>T (p. R224H). For abbreviations, see legend for Figure 1. NKH, nonketotic hyperglycinemia HIE, hypoxic ischemic encephalopathy; ACA, anterior cerebral artery; DD, developmental delay; LS, Leigh syndrome; EIEE, Early infantile epileptic encephalopathy; SB, suppression burst; DD, developmental delay; y, years; mo, months; d, days; s, seconds. Table 3: EEG morphology of 22 patients with suppression bursts. Eighteen patients (82%) had asynchronous SBs with various etiologies: mitochondrial diseases, metabolic diseases, structural anomalies (not HIE), HIE, and others. However, 12 patients had pure asynchronous SBs: 11 patients had structural abnormalities (including HIE), 1 had citrullinemia (P5). Patients with severe HIE had EEG SBs for the longest duration (Tables 3 and 4). A continuous background on the EEG was reached at 15 days in the patient with citrullinemia (P5), and at 3 months in the patients with EIEE (P1) and Aicardi’s syndrome (P4). A continuous background was never reached in the patients with severe HIE and with NKH: myoclonic seizures were still prominent in both patients with NKH and with severe HIE. In the patient with EIEE (P1), however, tonic seizures became predominant after 2 years, and the EEGs changed into multifocal independent spike foci after the patient turned 11 months old, and then into prominent frontal spikes after 1 more year. NKH, nonketotic hyperglycinemia HIE, hypoxic ischemic encephalopathy; ACA, anterior cerebral artery; DD, developmental delay; LS, Leigh syndrome; EIEE, Early infantile epileptic encephalopathy; SB, suppression-burst; DD, developmental delay; y, years; mo, months; d, days; s, seconds. Table 4. Summary of seizure semiology and EEG evolution of 22 patients with suppression bursts. Patients with unilateral SBs had better outcomes in walking (p<.001) and neurodevelopmental status (p<.001), but not a significant different life expectancy than did patients with bilateral SBs (Table 5). +P-value is for comparisons between SYNC SBs group + SYNC+ASYNC SBs group and ASYNC SBs group. ±P-value is for comparisons between SYNC SBs group and ASYNC SBs group. Table 5: Outcomes, based on electroencephalographic (EEG) morphology, of 22 patients with EEG suppression bursts. The outcomes were relatively better in patients who had unilateral SBs with structural diseases as the etiologies: 1 had mild and 3 had moderate DDs at 3 years old, they survived longer, and they were finally able to walk. Regardless of etiology, however, patients with unilateral SBs had better outcomes than did patients with bilateral SBs (Table 5), except for P3, who had HIE with unilateral SBs and isoelectric activity in the other hemisphere. In 16 patients with bilateral SBs, regardless of etiology, all had severe IDs and could not walk: 10 died before they turned 3 years old. The outcomes were worse in patients with purely synchronous bilateral SBs, 75% (3 out of 4) of whom died before they turned 3 years old. In the SYNC+ASYNC group, the neurodevelopmental outcomes were not significantly different from those in the SYNC group synchronous, but 66.7% (4 out of 6) of the former survived for more than 3 years. Outcomes for ASYNC group patients were not significantly different from those for SYNC group patients, but the former survived for significantly (p = 0.022) longer. Of the 15 patients who survived, 10 had severe DDs, 4 had moderate DDs, and 1 had mild DDs. Outcomes were best in patients with unilateral SBs with treatable diseases like citrullinemia: they had mild DDs. All 15 patients with bilateral SBs had grave outcomes, except for the one with an unidentified etiology (P17). EEGs that show SBs are considered predictors of grave encephalopathy. However, little of the published literature discusses neurodevelopmental outcomes based on electroencephalographic morphology with suppression bursts. Outcomes were best in patients with unilateral SBs, and treatable diseases. Patients with unilateral SBs have significantly better outcomes in walking (p<.001) and neurodevelopmental status (p<.001), but not significantly different life expectancies than do patients with bilateral SBs. In addition, the focal SBs in one hemisphere from our patients were often caused by marked brain abnormalities: structural lesions, HIE, and vascular infarctions. The evolution of EEG patterns of epileptic encephalopathy from different causes is of interest because the evolution of the EEG background pattern is an important contributor for predicting the outcome quality of patients with grave brain dysfunction [13,14]. Studies on SB patterns report that NKH accounted for a large proportion of EME/EIEE cases, and that their SBs evolved into hypsarrhythmia before the patients turned 1 year old [15,16], which agrees with our results in patients with NKH (P20 and P21). The only exception was P2, whose EEGs showed persistent SBs at 6 years old. A similar finding that a 5-year-old patient with NKH had SBs has been reported . In P1, who had EIEE with because of the hypoplasia of the corpus callosum and probable structural abnormalities, SBs transformed into hypsarrhythmia after he turned 3 months old, were replaced with diffuse slow spike-waves and multiple independent spikes after he turned 1 year old, and then with prominent frontal epileptic spikes after he turned 2 years old. Therefore, contrary to the findings that EIEE evolves into West syndrome and then into Lennox-Gastaut syndrome with age, EME shows no unique evolution. It is increasingly that EIEE and EME should not be regarded as independent disorders, but as the same disorder at different ages or stages of disease progression and that their etiologies might overlap. Thus, an EME like NKH evolves into West syndrome with a continuous background EEG or into persistent encephalopathy with SBs. Hence, we did not distinguish between EIEE and EME in the study. The mechanisms that cause lasting SBs or transform early-onset epileptic encephalopathy into hypsarrhythmia are unclear. Although hypsarrhythmia EEGs are considered to have a continuous background different from that of discontinuous SBs, they share a poor clinical prognosis . We also found that, in some patients, hypsarrhythmia and SBs were sometimes concurrent during an EEG, particularly in patients with hypsarrhythmia EEG turned into sleeping. Therefore, we hypothesized that hypsarrhythmia is one form of an SB evolution that manifests in a chaotic and nonsynchronized pattern of EEG. We also found that some patients with SBs and, for example, citrullinemia and porencephaly, were treatable. In patients with metabolic disorders and SBs, pyridox(am)ine-5-phosphate oxidase deficiency and pyridoxine-dependent epilepsy should be included in the differential diagnosis of neonatal SB EEG as treatable underlying causes . In addition, some patients with SBs had a biotinidase deficiency, and their epilepsy was controlled using biotin and adjunctive antiepilepsy agents. Similar examples of treatable SBs include: folinic acid-responsive seizures and cerebral folate deficiency, which can be treated using folinic acid in addition to pyridoxine ; tetrahydrobiopterin deficiencies with or without hyperphenylalaninemia, which might respond to substitution therapy with tetrahydrobiopterin and neurotransmitter precursors ; creatinine deficiency syndromes, which can be treated using creatinine monohydrate and dietary restrictions ; and glucose transporter type 1 (GLUT1) deficiency syndrome, which usually responds to a ketogenic diet . Although there are few such treatable cases, we should be mindful of these possibilities. Neonatal SBs have varied etiology-dependent patterns of evolution and grave outcomes, except in patients with treatable metabolic disorders and focal structural anomalies that lead to unilateral SBs. In patients with predominantly synchronous SBs and without lesions in magnetic resonance images, the etiology is usually metabolic or genetic. Patients with synchronous SBs had worse outcomes; specifically, they usually could not walk. The neurodevelopmental outcomes were relatively better in patients with asynchronous rather than with synchronous SBs. Outcomes were best in patients with unilateral SBs and treatable diseases. Outcomes were relatively better in patients with asynchronous rather than with synchronous SBs. Focal SBs in one hemisphere were often caused by marked brain abnormalities. We thank everyone who participated in the present project. This work was supported by Chung Shan Medical University grants CSH-2013-C-031 and CSH-2014-C-011. ICL conceived of the study, interpreted the EEG data, carried out the molecular genetic studies, and drafted the manuscript. SYL draft the manuscript. All authors read and approved the final manuscript. Maheshwari MC, Jeavons PM. The prognostic implications of suppression-burst activity in the EEG in infancy. Epilepsia 16(1), 127-131 (1975). Ohtahara S, Yamatogi Y, Ohtsuka Y. Prognosis of the Lennox syndrome-long-term clinical and electroencephalographic follow-up study, especially with special reference to relationship with the West syndrome. Folia. Psychiatr. Neurol. Jpn 30(3), 275-287 (1976). Ohtahara S, Ohtsuka Y, Yamatogi Y, et al. The early-infantile epileptic encephalopathy with suppression-burst: Developmental aspects. Brain. Dev 9(4), 371-376 (1987). Ohtahara S, Yamatogi Y tic encephalopathies in early infancy with suppression-burst. J. Clin. Neurophysiol 20(6), 398-407 (2003). Thömke F, Brand A, Weilemann SL. The temporal dynamics of postanoxic burst-suppression EEG. J. Clin. Neurophysiol 19(1), 24-31 (2002). Engel J Jr; International League Against Epilepsy (ILAE). A proposed diagnostic scheme for people with epileptic seizures and with epilepsy: report of the ILAE Task Force on Classification and Terminology. Epilepsia 42(6), 796-803 (2001). Nordli DR Jr. Epileptic encephalopathies in infants and children. J. Clin. Neurophysiol 29(5), 420-424 (2012). Olson HE, Kelly M, LaCoursiere CM, et al. Genetics and genotype-phenotype correlations in early onset epileptic encephalopathy with burst suppression. Ann. Neurol 81(3), 419-429 (2017). Morava E, van den Heuvel L, Hol F, et al. Mitochondrial disease criteria: diagnostic applications in children. Neurology 67(10), 1823-1826 (2006). Volpe JJ. Neurology of the Newborn. 5th ed. Philadelphia: WB Saunders Company; (2008). Stockard-Pope JE, Werner SS, Bickford RG. Atlas of Neonatal Electroencephalography. New York: Raven Press; (1992). Lee IC, Lee NC, Lu JJ, et al. Mitochondrial depletion causes neonatal-onset leigh syndrome, myopathy, and renal tubulopathy. J. Child. Neurol 28(3), 404-408 (2013). Hofmeijer J, van Putten MJ. EEG in postanoxic coma: Prognostic and diagnostic value. Clin. Neurophysiol 127(4), 2047-2055 (2016). Khan RL, Nunes ML, Garcias da Silva LF, et al. Predictive value of sequential electroencephalogram (EEG) in neonates with seizures and its relation to neurological outcome. J. Child. Neurol 23(2), 144-150 (2008). Markand ON, Garg BP, Brandt IK. Nonketotic hyperglycinemia: electroencephalographic and evoked potential abnormalities. Neurology 32(2), 151-156 (1982). Chen PT, Young C, Lee WT, et al. Early epileptic encephalopathy with suppression burst electroencephalographic pattern--an analysis of eight Taiwanese patients. Brain. Dev 23(7), 715-720 (2001). Saneto RP, Sotero de Menezes M. Persistence of suppression-bursts in a patient with Ohtahara syndrome. J. Child. Neurol 22(5), 631-634 (2007). Mastrangelo M, Peron A, Spaccini L, et al. Neonatal suppression-burst without epileptic seizures: expanding the electroclinical phenotype of STXBP1-related, early-onset encephalopathy. Epileptic. Disord 15(1), 55-61 (2013). Guerin A, Aziz AS, Mutch C, et al. Pyridox(am)ine-5-phosphate oxidase deficiency treatable cause of neonatal epileptic encephalopathy with burst suppression: Case report and review of the literature. J. Child. Neurol 30(9), 1218-1225 (2015). Al-Baradie RS, Chaudhary MW. Diagnosis and management of cerebral folate deficiency. A form of folinic acid-responsive seizures. Neurosciences (Riyadh) 19(4), 312-316 (2014). Thiele AG, Rohde C, Mütze U, et al. The challenge of long-term tetrahydrobiopterin (BH4) therapy in phenylketonuria: Effects on metabolic control, nutritional habits and nutrient supply. Mol. Genet. Metab. Rep 26(4), 62-67 (2015). Nouioua S, Cheillan D, Zaouidi S, et al. Creatine deficiency syndrome. A treatable myopathy due to arginine-glycine amidinotransferase (AGAT) deficiency. Neuromuscul. Disord 23(8), 670-674 (2013). Fujii T, Ito Y, Takahashi S, et al. Outcome of ketogenic diets in GLUT1 deficiency syndrome in Japan: A nationwide survey. Brain. Dev 38(7), 628-637 (2016).